Musicals, by their very nature, can often feel a little stagy and over-the-top but with the Divine Miss M at the epicentre displaying her triple threat talents of singing, acting and dancing, somehow bursting into song at the drop of a hat seems all too natural. 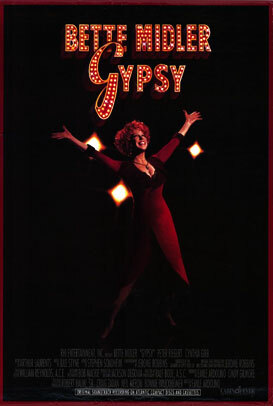 Midler is in her element headlining as Rose, the star-struck stage mother in the made-for-television adaptation of the musical Gypsy. A frustrated showgirl at heart she is living out her dreams through her two daughters and paving a way to a better life – eating dog food in the apartment she shares with her grumpy old father in Seattle isn’t exactly her idea of a good time. Her eldest daughter Louise (Cynthia Gibb) is the shy retiring type but Baby June (Jennifer Rae Beck) is a high-kicking, tap dancing, baton twirling “bundle of dynamite” destined for big things, at least in Rose’s eyes. With the ever supportive Herbie (Peter Riegert) by their side, their corny act becomes the toast of the vaudeville circuit. As the years go by, however, talkies start replacing live acts and it becomes harder for them to get the gigs. It’s also increasingly tricky for June to pass herself off as a nine year old and eventually she flees her mother’s clutches to seek her own fortune. In desperation, Rose tries to shove Louise centre-stage resulting in her unexpectedly becoming a celebrated burlesque artist. The story was “suggested” by the memoir of Gypsy Rose Lee, the high class stripper in question, and it was put to music by Jule Styne with lyrics by Stephen Sondheim. The original stage choreography was created by the legendary Jerome Robbins and recreated here by Bonnie Walker. With the incomparable Midler belting out show-stoppers bumper to bumper, this tale about the shimmering illusion of stardom strikes a lively yet cautionary note.